A few weeks ago, I acquired Breath of Death VII: The Beginning, Cthulhu Saves the World, and all three episodes of Penny Arcade Adventures for eight bucks on Steam. 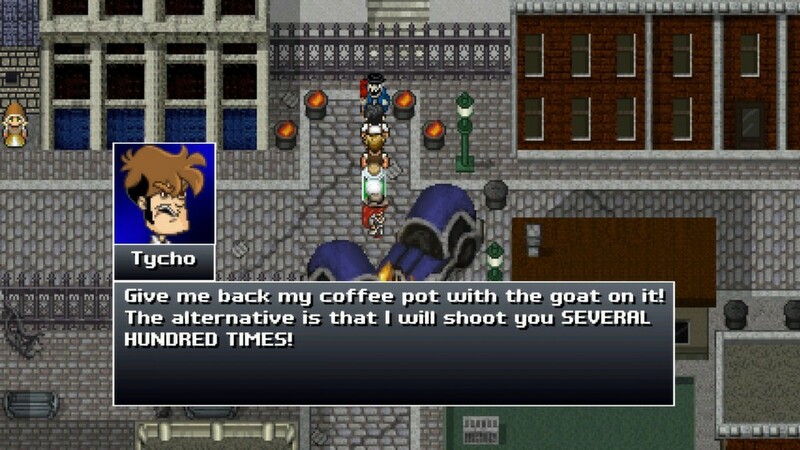 It seemed like a steal at the time: five brief RPG comedies for less than I spend on my daily commute. I dropped Breath and Cthulhu after a few hours. Zeboyd’s nutty tributes to ‘80s JRPGs had their moments, but not enough to excuse dull battles, random encounters, and big empty dungeons. The first two Penny Arcade games weren’t much better. My disgust for their fetch quest campaign structure smothered my fondness for the Mario RPG-style battles. So when I saw that Penny Arcade’s Whatever 3 was the result of a Zeboyd/Penny Arcade team-up, I braced myself for some whole new amalgam of repulsive game elements. It turned out to be a roundly enjoyable seven-hour adventure, one that almost excuses the twelve hours I slogged through the other four games in the bundle. Almost. Rain-Slick 3 picks up the tale of brutal lackwit Gabe and verbose supernaturalist Tycho on their noir/eldritch adventures in god-slaying (two down, two to go). The customizable player stand-in character from the first two episodes is dropped from the story; the new playable quartet is rounded out by private detective Moira and Jim, a silent skull in a jar of preserving liquid. With the new starring cast comes a new battle system. The active, streamlined approach of prior Penny Arcade games is dropped in favor of a turn-based menu of classes and commands resembling Final Fantasy VI, sans the ever-crawling progress bars. Instead, PA3 features a sort of battle timeline at the top of the screen that gives the player a preview of turn order and a sense of each battler’s comparative speed. A handful of abilities can manipulate the timeline as well. It’s not the battle system centerpiece, as were the manageable queues in Radiant Historia and Final Fantasy X, but it’s a useful, unique function. The real delight in PA3 battles stems from the character job system. Each party member has his or her own specific skillset (Gabe’s Brute attacks, Jim’s Necromancy) but can also equip two more from a dozen interesting and swappable classes. Players will inevitably find a few quirky favorites among the collection, whether it’s the delayed-spellcasting Apocalypt, the berserker Dinosorcerer, or the teammate-leeching Diva. There’s gold to be mined from the customizable combos: I found my tank character by pairing the Tube Samurai’s defensive stance with the Crabomancer’s defense-as-offense abilities. Many skirmishes ended with his first attack. Battles aren’t just strategic playgrounds, they’re also the game’s richest source of the funnies. While the foulmouthed Pinky and the Brain dynamic of Gabe and Tycho only periodically gets a genuine laugh, the enemy concepts and attack names are imbued with parody of 16-bit whimsy and carry snarky descriptions. You’ll face living typewriters with attacks like “Infinite Monkeys” to a rousing lo-fi orchestra, firing off magic spells like “RTFM,” “Sole Edge,” and “SHUT UP!” It’s a big step up from the incessantly recycled mimes, hobos, and straitjackets of past PA games and their barebones selection of offensive tools. The battle system changeup elevates PA3 above its predecessors, but the greatest improvement is the superb pacing. PA3’s constant forward jog through dungeon after dungeon helps heal the scars of its predecessors’ repetitive point-and-click errand atrocities. Equally relieving is the absence of the random battles that plagued past Zeboyd games. The game’s encounters are expertly placed: each setting has just enough skirmishes to introduce and accustom the player to new enemies, moving on before the novelty wears out. And the challenge level was nearly perfect throughout (on Normal difficulty). Scrub monsters punish brainlessness but are dispatched quickly enough, while bosses require sound planning and careful execution. And the constant character and class growth ensures that you’ll never lack for tools of strategy: even the classes that go unused seem to level up after every battle. The player is never encouraged nor expected to level grind. I don’t think it’s even an option. If Penny Arcade 3 has any weak points, they’re cosmetic. The shift to a retro SNES style is harmless though also without merit, as the pixelated visuals certainly don’t benefit the old-timey earth tones that dominate much of the show. Some of the lengthier narration paragraphs feel out of place in a visual medium: why resort to exhaustive ramblings when the game’s 16-bit inspirations effortlessly conveyed action through crude sprites and brief dialogue? And the semi-serious narrative backdrop is as distant as ever, as characters’ driving motivations are largely squeezed into a handful of brief events. The issues are remarkably few; certainly fewer than I anticipated after choking down the first two installments of Penny Arcade Adventures. I promised to quit the series if I didn’t like the first taste of Episode 3. Yet seven hours of playtime later, I’m hungry for more. This Zeboyd/Penny Arcade partnership is like two weekend garage bands meeting at a free show and suddenly coalescing into Weezer. Is it worth the money? Yes. 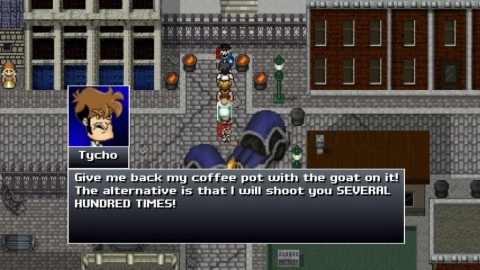 Five bucks seems like the bullseye for a light, amusing RPG. If you need more value, it’ll probably show up in plenty of indie bundles going forward. Is it worth the time? Yes. There’s minimal padding in this seven hour quest. Don’t worry about playing the first two episodes, they’re almost entirely irrelevant to the events and humor of Episode 3.